Choose your table with the limit you require, than ask the dealer for the chips you would like to play with. That will be your own colour of non-value chips, which cannot be moved from table to table. Place your chips to cover your chosen numbers -on the top of other chips if it is necessary- until the dealer calls “No more bets”. The ball will stay still in a numbered slot and this is the winning number. Losing bets will be cleared; all chips connected to the winning number will then be paid. On the tables there are some bets accepted that are derived from the verbal bets of French Roulette. These are the wheel section bets and the neighbour bets, which are a method of covering various sections of the wheel. (VOISINS, ORPHANS, TIER, ZERO SPIEL, GIOCCO). When leaving the table, you must change your chips into value chips. The Roulette wheels used in the Las Vegas Casino are the same type as those used all over Europe, with a single zero. If you have any questions or if you would like to know more about Roulette, please ask our Casino Management or staff, and they will be happy to assist you. In the case of zero, even chances are halved. Minimums and maximums are displayed at each table. The goal of the game is to achieve no more than 21. If a player makes 21 with the first two cards (ace & ten value card) this is a Blackjack and pays 3 to 2, unless the dealer has Blackjack, it is then a stand-off. Players may not draw to a hard 21 or Blackjack. If there is only one player, a minimum of two boxes must be played. Maximum three players per box. Table maximums are per box, not per player. If the first two cards of the player have equal value, the player may split them. 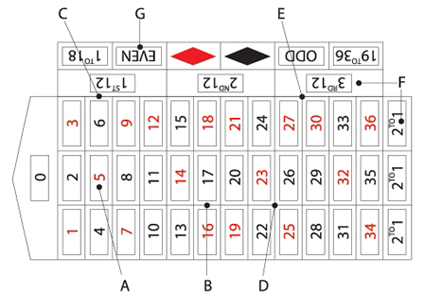 A stake must be placed corresponding to the original stake on the second card. The two hands are now completed in turn. Each player may continue to split cards of equal value, doubling is possible after a split, except aces, three times (four hands). On splitting aces, only one card will be received on each. After splitting aces, 21 made of two cards is not considered as a Black Jack. Players may double their stake on any first two cards they receive (except Blackjack) and will receive only one card on the hand. Doubling is possible after a split. If the first card of the dealer is an ace, the player may buy insurance against a possible dealer’s Blackjack by placing up to half the original stake on the Insurance Line. If the dealer makes a Blackjack, the insurance is paid 2 to 1, if the dealer does not make a Blackjack, the insurance loses. It is forbidden to advice fellow players about the game strategy. Minimums and maximums are displayed at each table. You must make a standard Blackjack wager. You may also make the House Money wager for any amount within the posted limits. You will then get your first two cards. Do not touch the chips while they are in action. The dealer will move them for you. 1. After the initial deal, players may buy up to two additional cards. The cost of the new card will be equivalent to the original ante bet. In the case of two cards being exchanged, the cost will be twice the ante. 2. Players are required to surrender cards to be exchanged before receiving new ones. 3. Player must fold or raise (Bet.) Bet wager is exactly equal to twice the ante. 4. The bank is not allowed to change cards, and will qualify with Ace-King or higher. 5. If the player wins with higher combination, the Ante pays even money, and the Bet pays according to the winning combination. 6. If dealer does not qualify, the Ante pays even money. 7. The winning combination odds are marked on the table. 1. The Jackpot increases with each bonus bet staked. 2. The Poker Bonus can be played with 200 HUF or 1 € per hand. 3. The Poker Bonus combinations will be paid only on the first five original cards dealt. 4. It is the player’s responsibility to indicate qualified hand for the Poker Bonus. 5. Payout for qualified winning combination of a Straight Flush will be 10% of the Jackpot. 6. Payout for a qualified winning combination of a Royal Flush will be 100% of the Jackpot. 7. In case there are more than one Poker Bonus winners at the same time with the same combination, the Jackpot will be shared evenly between the players. In case there are different qualified combinations for the Poker Bonus at the same time, the lowest combination hand will be paid out first. For more details please ask our table staff! Ultimate Texas Hold’em features heads-up play against the dealer and an optional bonus bet. The earlier you bet, the more you can bet. You don’t have to fold until you see all the community cards. The Trips bonus pays odds if your final five-card hand is a three-of-a-kind or better. Make equal bets in the Ante and Blind cirlcles. You may also make the optional Trips bonus bet. You will then receive two cards. When you get your two hole cards, you can either check or bet 3 or 4 times your Ante. The dealer then reveals the three-card flop. If you haven’t already made a Pay bet, you have a choice: check or bet 2 times your Ante. The dealer then reveals the final two community cards. If you haven’t already made a Play bet, you have a choice: bet equal to your Ante or fold. The dealer then reveals his two hole cards and announces his hand. To win even money on your Play and Ante bets, you must beat the dealer’s hand. In the case of tie, those bets push. The Blind pays if your winning hand is at least a Straight, if you beat the dealer with less than a Straight, it pushes. Please refer to the table layout for payout details and the table sign for minimum and maximum bets. Players may bet on the Bank (Banco) or the Player (Punto) at even money (except when the Bank wins with 6, in that case it pays only 1 to 2). Guests may also bet the Tie (Egalite) at odds of 8 to 1. ACE: count value of 1. PICTURE or 10: count value 0. The object of the game is to come closest to the point of 9. Hands shall comprise of two or three cards, drawn according to the TABLEAUX (see below). To determine the point, the last figure of the total value of the hand should be taken. A point of 0 shall be termed “Baccarat”. A natural is a point of 8 or 9 in the first two cards, to the Bank or Player. The first and third cards are to the Punto, the second and fourth cards are to the Banco. The drawing of any additional cards shall be determined by the TABLEAUX. *draw another card if Punto stands with 6 or 7. Card drawing is not optional, it must be done by the rules.